With only three weeks to really train for distance, I knew this would be a tough race but I was mostly excited to scratch that half marathon itch! 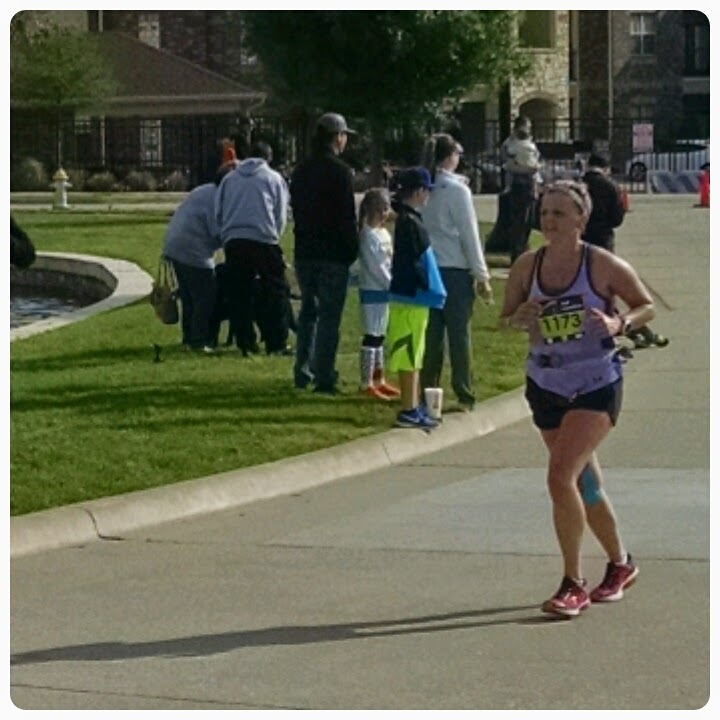 I've had a blast doing 5K's, but deep down I'll always be a distance runner. Going into race week I had zero expectations for the race and sadly, I had zero confidence going into it as well. Why? The week before I got in an 11 mile run and it was awful (by awful I mean in comparison to MY previous training, nobody else). I had to stop 4-5 times to stretch, my whole body ached and I ended up at 11:25/mile. 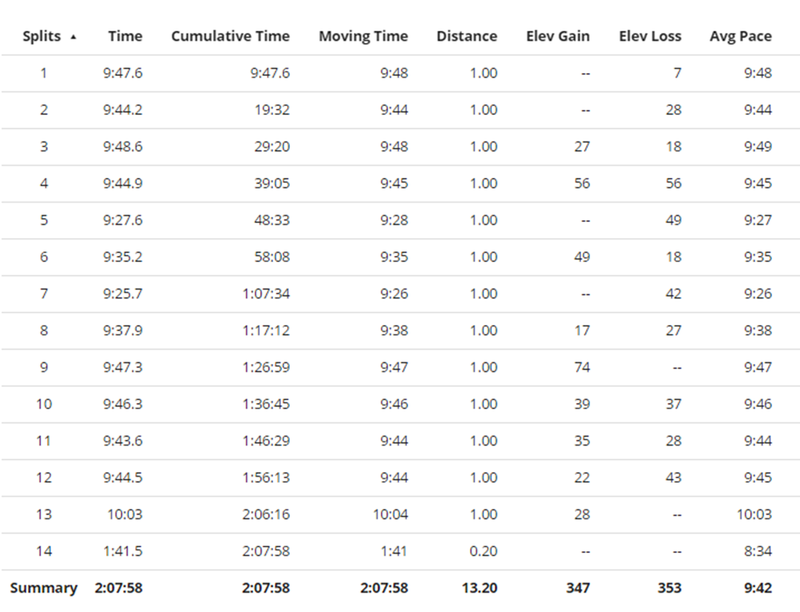 It took me 2:05:31 to run 11 miles. When I finished that training run I actually told Brandon that I regretted upgrading to the half and it was a foolish move. 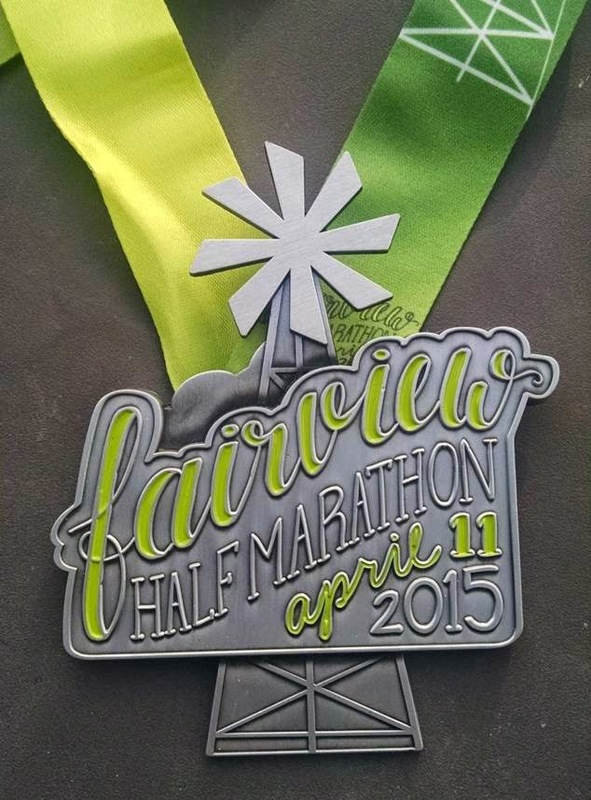 While, a PR was never my goal for Fairview, I wanted to feel good during the race and with the pains I was feeling that day I just knew it was going to be a 13 mile death march. The whole week leading up to the race they had been predicting thunder storms but on Friday, the weather Gods were blessing us with a much cooler and dry forecast! 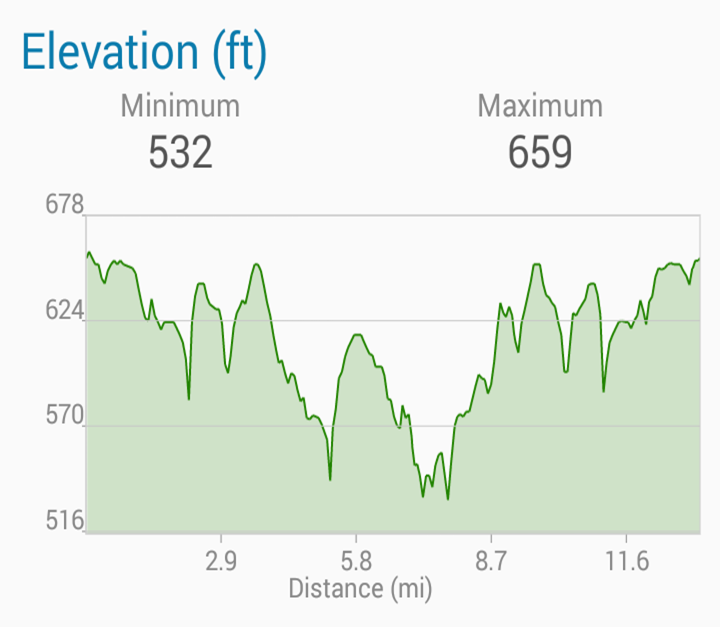 I started to get excited about the race and just decided that if anything, this was going to be a great hill repeats workout with a ton of friends! Race morning was a beautiful morning at about 56 degrees and partly cloudy. I decided to line up with the 2:10 pacers and hang there for as long as I could. The race started and immediately I settled into a 9:45 pace. Miles 1-4: I felt surprisingly good these first few miles so my new goal was to just hold this pace as long as I could and see how far it got me. I honestly expected to sputter out around mile 9 (hello Old Stacy Road hill) but I'd bank some time while I still felt good. 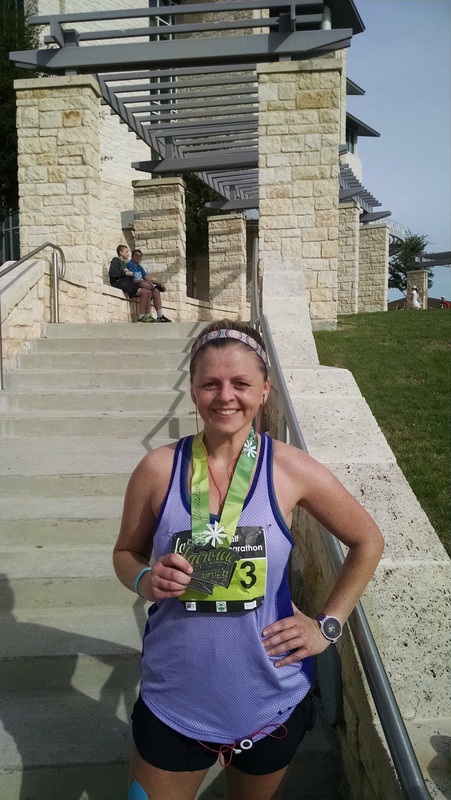 Miles 5-8: These miles were a blast! There was a cool-ish breeze and the sun was starting to peak out! 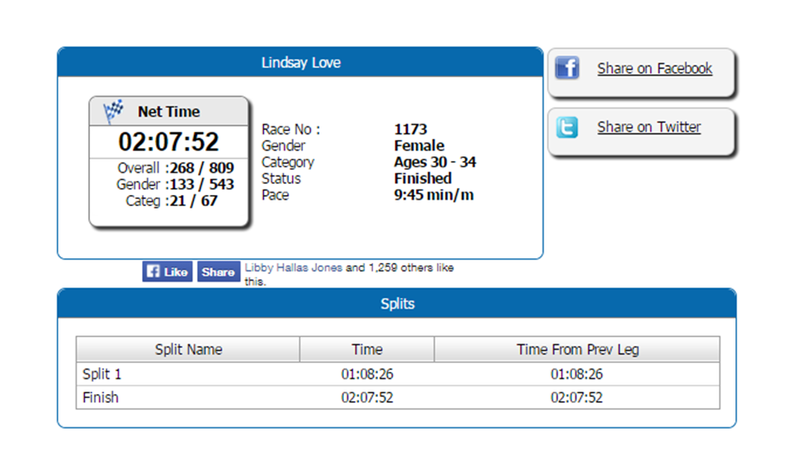 I picked up the pace without even noticing and squeezed in a 9:27 & 9:28 mile. Miles 9-11: Going into mile 9 is where you encounter the most beastly hill of them all, Old Stacy Road. Damn you. Having run this race a few times, I knew exactly what I was in for. Once you make your way up you get a slight reprieve before turning to make your way up regular Stacy Road. I don't like anyone named Stacy. ;) Even after the climbs I was shocked to still be keeping a 9:45ish pace so at that point I knew I could at least finish in under 2:15. Mile 12-13: Mile 12 is where my good pace almost came to a screeching halt. Everything hurt and the legs just didn't want to move. I desperately wanted to finally take a walk break but I looked down at my watch, did some quick math and realized that if I walked and added 2.5 minutes to this per mile pace, I'd miss out on a PR by about 35 seconds. After I realized that, my next thought was "Oh hell no I'm not walking!". I didn't just run a fantastic race, on a whim, to just throw it all down the tubes one mile out. I took what was left of my GU and just ran. As I was approaching the 13 mile marker I saw that not only was I going to PR but it was going to be a decent one! Side note: A HUGE thank you to the guy with the long hair wearing the TX running shorts standing near the 13 mile marker. 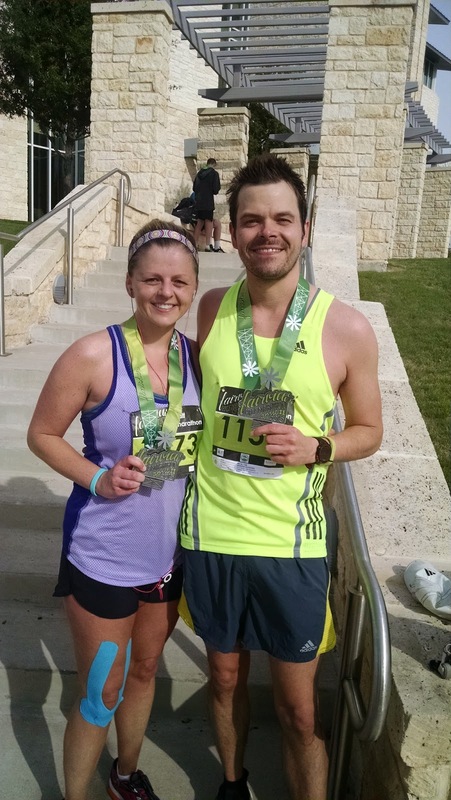 I was running on fumes, trying to refrain from puking and your high five and words of encouragement are what propelled me to run as hard as I could to get an even loftier PR. I don't know who you are but thank you! In all honesty, I was shocked. But very happy! Brandon also had an awesome race, a course PR, with a finish time of 1:45:13. I'll probably always be my own worst enemy when it comes to believing in myself. That 11 mile run the week before is a perfect example of what I always tell other runners, do NOT let one run discourage you. I should be better at taking my own advice. Not every training run will be great and not every race will be a PR. The one thing I am thankful for is that despite my doubts, I still decided to leave it all out on the course that day. I had nothing to lose and everything to gain, and I'm so glad I did. Thank you to The Active Joe for another event that was full of laughs and lots of fun! The race was great, the volunteers were amazing and the citizens of Fairview were so awesome in being out there to cheer us on! The spirit of the running community is what sets us a part from any other sport. I've never met another group of people who truly know how to put the magic in the misery of those hills, and encourage each other to be better each and every day. The entire 13.1 miles yesterday there was someone cracking jokes, cheering each other on, being super cheesy for the camera and all around having a good time. It was definitely some of the most fun miles I've ever been in! The Active Joe also produces one heck of a medal for every race! The windmill spins!